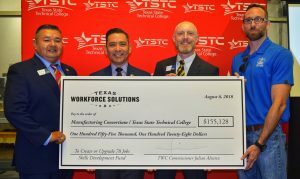 (WACO) – Leaders from Texas State Technical College, the Texas Workforce Commission and Evans Enterprises Inc., a company specializing in wind turbine repairs, gathered Monday to commemorate a $155,128 Skills Development Fund grant. The grant will create or upgrade 78 industrial jobs at the company’s Abilene, Waco and Wichita Falls facilities. Jerry Boroff, a graduate of TSTC’s Electrical Power and Controls program and plant manager for Evans’ three sites in Texas, said workers have already learned about basic electrical theory and electrical safety. Evans employees from Abilene and Wichita Falls travel to the Waco facility for training. “We get to educate the guys and they feel more comfortable in their jobs,” Boroff said. 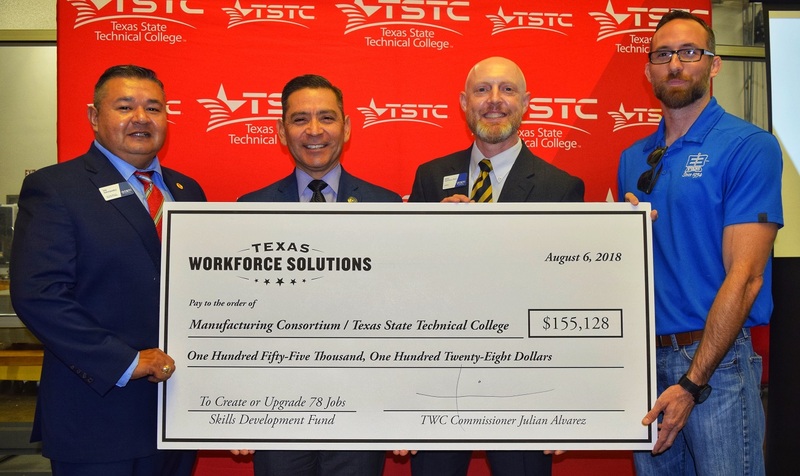 TWC Commissioner Representing Labor Julian Alvarez III said TSTC’s work with the wind turbine industry signals the diversification of the state’s economy. “You have customized training for industry need,” Alvarez said. The Skills Development Fund has been used since 1996 to localize workforce training for companies. This enables companies to work directly with local partners to develop training tailored to employees’ needs. The fund has helped to create or upgrade more than 342,400 jobs in Texas. The fund has assisted more than 4,200 employers statewide. Evans Enterprises Inc. was founded in 1954 and has 10 plants in four states. This entry was posted in Waco on August 6, 2018 by Daniel Perry.